The Boy. The Ride. The Castle. The...me. 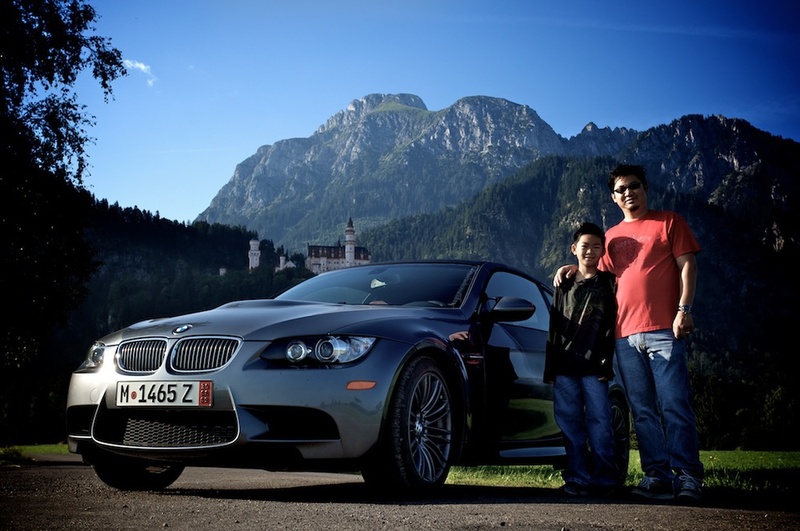 Here's a couple of pics taken from “the spot” recommended on Bimmerfest with Neuschwanstein Castle in the background. This just happens to be a private road but we got there pretty early in the morning so there was no one around. Worked out well. One guy came riding by on a bicycle – I think to check up on us, making sure we weren't doing anything weird – but other than that, it went pretty smoothly. I worked fast, hehe. The car actually had a bunch of dew on it since it was parked outside the previous night and some birds decided to use it for target practice so I was a little worried about how the pic might come out. But for the most part, you can't really see any of the “flaws” (except for that reflection of the dork in the bumper of the second pic).